What would Hong Kong say about its own history? How would it speak to you, if you were to interview this hometown of yours where you're born and raised, a city you've loved all your life? Hong Kong writer in English Xu Xi offers her thoughts in her upcoming collection of essays, Evanescent Isles, a book that weaves the author's observations of Hong Kong with anecdotes of current affairs, as well as memoirs of her own past. The idea of examining the changes of Hong Kong through her life and times hit Xu at an unexpected moment. Shuffling in a crowded MTR train, Xu heard the trilingual announcement of "please mind the platform gap", which she found intriguing. "I looked up the word 'gap' in Chinese, which also means 'crack'," Xu said. "I wondered if it was also a metaphor of Hong Kong: a crack in time in the history of Hong Kong. What happened in our past, when Hong Kong is a very young city?" The "crack" in time Xu refers to is the city's return to its motherland, after which Hong Kong has been becoming more and more Chinese as a natural trend. Its cosmopolitan background, however, remains a part of its unique character. "It's also true about my own background," said Xu, a Chinese-Indonesian native of Hong Kong who left home in her mid-20s. "The title of the book is about the idea of change, since Hong Kong is such a fast-changing place." During her research for the book, Xu dived into different aspects of Hong Kong culture, from its jazz scene and film industry, to the emergence of private kitchens in town. Public transport is also a curious pointer to the city's transformation. "I took all forms of public transport and wandered around Hong Kong," Xu remarked. "A taxi driver complained to me about waiting outside the airport for four hours. Nobody takes taxis anymore: other alternative transports are so efficient." The changes in local public transport intersect with precious memories in Xu's life. In her teens in the 60s, Xu and her sister, who is one year younger, boarded the black-market mini-buses with excitement and fright. "My sister and I would go, 'Aiya! I hope it stops at the right place!' since the mini-bus might skip a stop when the cops were around," Xu recalled. "Nowadays mini-buses are legal and the drivers have licenses and routines." Her first book of non-fiction, Evanescent Isles is dedicated to her sister, who experienced the same Hong Kong as Xu did in their early days. Xu recently edited an anthology of Hong Kong writing in English, Fifty/Fifty, which also explores the changes of Hong Kong in the past decade. "I was looking for a creative response, a state of mind in Hong Kong as the writers saw it," Xu explained. "I got quit a lot response. It surprised me. Over 60 percent of them came from Hong Kong Chinese writers. Many of them are new voices." The presence of Hong Kong Chinese writers is a new phenomenon in the English literary world in Hong Kong. Living in exile was the only choice, when Xu wanted to develop her writing in the 70s. "I studied in the US and came back to Hong Kong to work in marketing in 1974. 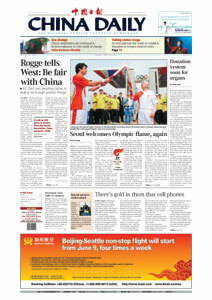 There wasn't any place to write in English here at the time," Xu recounted. "So I went to the US again for an MFA (Master of Fine Arts) degree on creative writing in 1981." After she obtained an MFA degree from the University of Massachusetts and worked in New York for several years, Xu returned to marketing in Hong Kong in 1992. As her novels began to be published in the 90s, Xu quit her career and devoted herself to creative writing completely in 1998. While Xu made her mark as a pioneer, most other local writers in English remained unheard of for much longer. Despite the gradual emergence of an English literary scene in the 90s, it was largely dominated by expatriate writers until recent years. The trend of Chinese writers in English, however, has started to grow since Hong Kong universities began to run courses in creative writing. Poetry readings, such as Outloud at the Fringe Club, also help gather a variety of interesting writers. "Most of these young Hong Kong writers have a very cosmopolitan outlook," Xu pointed out. "Their works touch on family stories, but also the idea of self and identity, of whom they are in relation to, what's happening out there." These young writers definitely have something to aspire to, as Xu made the short list of the prestigious, inaugural Man Asian Literary Prize in 2007, for her manuscript Habit of a Foreign Sky. (Left) Evanescent Isles by Xu Xi, published by the University of Hong Kong Press and available in May 2008. 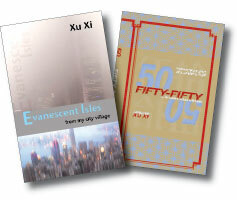 (Right) Fifty/Fifty: New Hong Kong Writing edited by Xu Xi, published by Haven Books. Set in the times of the Asian financial crisis in the late 90s, the story centers on the Eurasian protagonist who lost her entire family to a car accident. Her professional life is also at stake, as her company is going through major changes at the time of crisis. "The question is: what do we do when everything we used to is suddenly gone? It's a question about the changes in life, but also one that we are well aware of in Hong Kong," Xu said. Despite the accelerating speed of life in this town, Xu remains true to her identity as a Hong Kong writer. She depicts her hometown as she has always known it, even if it does not fit into foreign perception of Hong Kong or is not bankable. "Had I been more Asian American, I'd have had a different career by now," Xu said. "Publishers in the west are looking for Asian American stories, of writers going back to Asia to explore their origins. But it's not me and America is not my country." "I'm from Hong Kong and I write about where I'm from," she added. "Culturally, Hong Kong is a peculiar place and the rest of the world doesn't know what to do about it. Yet I'm not going to write literary versions of Wong Ka-wai movies. I have to be honest to who I am."